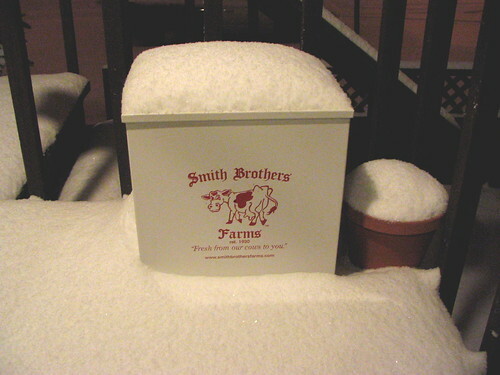 Snow from this morning, piled on a milk box. As you mentioned on the Twitter feed, those two thunder claps were pretty incredible. The first one was so loud it shook the house. My wife and I thought it was an earthquake… and one of the cats paniced and knocked a glass of the counter, shattering it. Bad kitty! Our cats were seriously freaked out. As were we, pretty much. My Other Half & I were awoken by the first enormous thunderclap – we too thought it was an earthquake at first. Cat seems to be suffering a bit of post-thundersnow-distress, poor kitty!